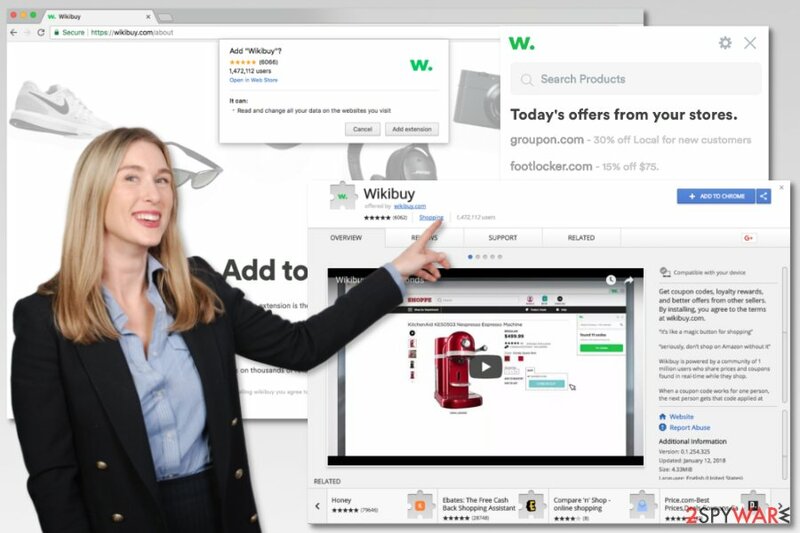 Wikibuy is a free Google Chrome browser extension that works as a browser assistant. It helps users to save money by giving price comparisons, best shopping deals, and discount coupons. However, this extension is widely discussed by the online community due to the numerous fake shopping assistants, possible privacy and developer's credibility issues. However, before starting Wikibuy review, we can ensure that it’s absolutely legitimate and safe to use. As well as other browser extensions and programs, this add-on also has pros and cons that we will discuss further. Saving the money – Wikibuy extension shows sellers that have the same good you are looking for and gives price comparisons. Thus, you can choose the lowest price of the product. 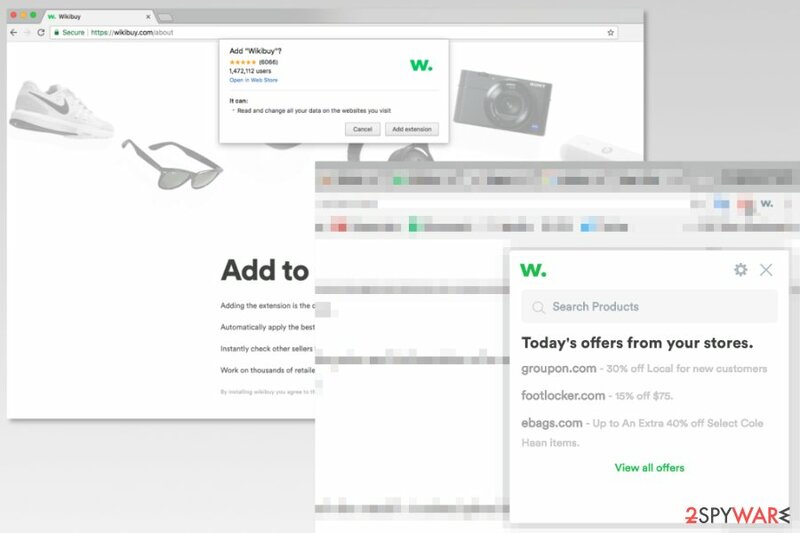 Wikibuy Checkouts – Chrome extension offers to speed up shopping procedure by using their payment system that allows skipping filling checkout forms and hiding your payment details from the sellers. Order tracking – they provide parcel tracking service, so you can see where you purchase is and when it is expected to be delivered to you. Money back guarantee – if your order goes missing, you can get a refund. Wikibuy provides 100% money back guarantee. Loyalty rewards – users get credits for frequent shopping using the app which can be turned into real discounts. Wikibuy legit app seems to enhance the shopping experience. However, it’s still a new product, and the company is trying to get its reputation and credibility. Nevertheless, the app has about 1 million users; not all of them are happy with it and chooses to uninstall Wikibuy and do their own researcher. However, if you find difficulties with Wikibuy removal, please scroll down to the end of the article and follow the guide given there. Despite all the advantages and positive feedback about the application, there are negative opinions as well. Among the most popular downsides are not providing the truly lowest price of the product, getting commissions from user’s purchases, long parcel delivery time, and data tracking. Users often ask whether Wikibuy is a scam or not. Nowadays there are many add-ons and browser extensions that pretend to be legit. However, they are used for collecting user's personal information, such as credit card details. However, this add-on is legal and does not steal any credentials. Users tell that Wikibuy does not always provide the lowest price. 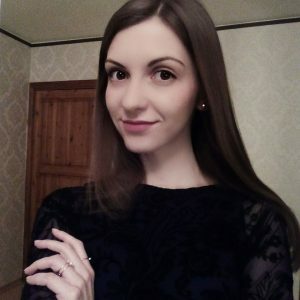 Despite the fact, it usually provides a lower price than Amazon; it’s still possible to find a product on other online shops which is cheaper if you do your research on the web. However, specialists from viruset.no warn that extremely low price might be a sign of something shady. Before grabbing the good you need, you have to double-check the information about an online shop and read user reviews. There’s a chance that you end up on a phishing site. Users assume that Wikibuy add-on does not provide truly lowest price on the market due to the possibly received commissions. Getting revenue is absolutely normal business practice. The add-on is available for free, and developers have to find a way to make income. However, not providing an actually smallest price is not very fair. Thus, users might not find this add-on trusted or reliable. In the forums, users also tell that buying products with Wikibuy provides longer shipping service compared to buying directly from Amazon or eBay. People report that instead of 2-day delivery, the time might be extended up to 4 days or even a week. However, the concerning fact is that all collected data might be shared with affiliates. Thus, you might see third-party ads based on your clicks, purchased goods or search queries. 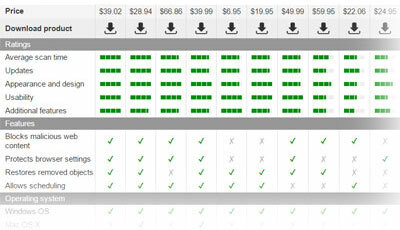 Unfortunately, Wikibuy Firefox, Safari or Internet Explorer versions are non-existent. If you access the official website using one of these browsers, you will be offered to enter your email on the submission page. Therefore, you won’t be able to install any browser extension and take advantage of its features when shopping online. However, there’s always an option to switch to Google Chrome, install this add-on and get the best price deals. Warning: if you find some add-ons or applications that claim to be compatible with other web browsers or offers to download the mobile app, they might be fake. You should check developer's website (www.wikibuy.com) before downloading app from the unknown app store. However, if you were ticked and installed bogus add-on or app, scan the system with reputable anti-malware software, such as Reimage to remove Wikibuy automatically. 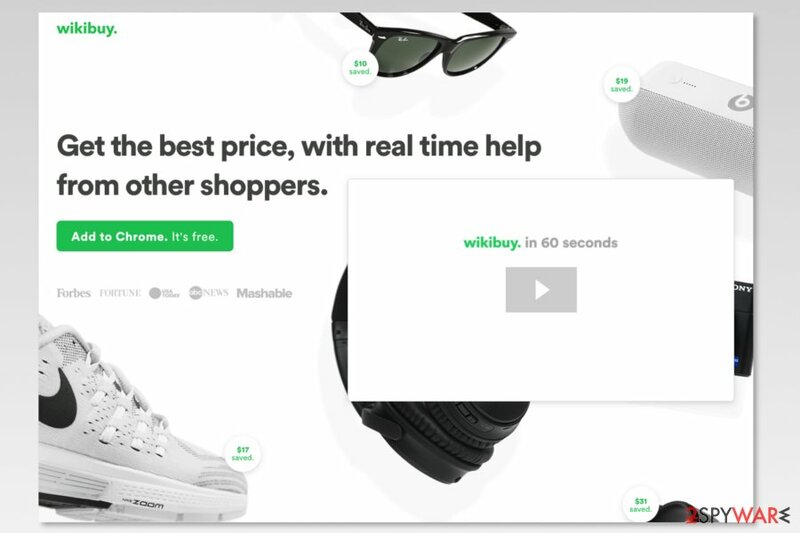 Wikibuy app is available on Chrome web store as well as on the official website wikibuy.com. Thus, users can download it manually without any difficulties. The extension itself requires only one permission – making changes on sites you visit. This activity is needed in order to display shopping offers or price comparisons on your visited e-shops. However, there’s a possibility that you might find Wikibuy offered to download in freeware packages. Software bundling is a legitimate marketing strategy. Though, you should be careful when installing programs and always check for the additional applications that you might not be willing or need to install. Thus, accidental installation of Wikibuy Chrome extension should not be considered as virus infiltration. As we have already mentioned, it’s a safe to use application that cannot cause any danger to your computer. However, developers also created Wikibuy iOS version which is available on iTunes. However, Android version of the app does not exist yet. Additionally, cyber criminals might be using the name of the app and create fake versions of the app. Therefore, you might find fake Wiki Buy extensions not only for Chrome, but Safari, Mozilla Firefox or other web browsers, or Android operating system. Usually, they fake extensions are available in third-party app stores. 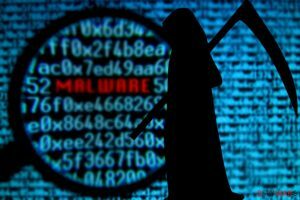 Thus, you should stay away from them because they might take control over your browser and cause browsing-related problems, as well as privacy issues. Navigate to More tools -> Extensions. Find Wikibuy and click on the Trash icon on the right. In the appeared pop-up click Remove option, and that’s all – extension is successfully removed. However, if you have installed a fake version of shopping assistant, you should take care of your computer’s security. We recommend using anti-malware software, such as Reimage, for bogus Wikibuy removal. System scan with security software will clean up your PC within a couple of minutes. ^ How Wikibuy Checkout works. Wikibuy. The official website. ^ Becky Mayse. Buyer Beware: New Online Shopping Phishing Scams. Office of the CIO. The official website of The Ohio State University. ^ Bertel King, Jr. Is It Safe to Install Android Apps from Unknown Sources?. MakeUseOf. The guide in modern tech. This entry was posted on 2018-01-17 at 06:34 and is filed under Browser Toolbars, Software.